Trial By Sapphire: Who Wore It Best? I'm adding a little #ThrowBackThursday flare to the blog today. My grandmother made this dress for me 30 years ago, and Presley tried it on last week. What's old is new again! There's not much to say other than... who wore it best? 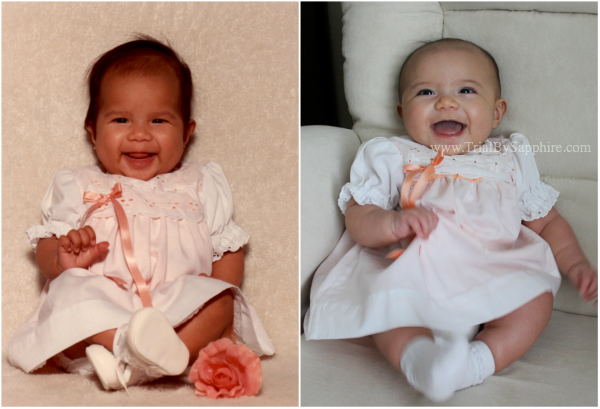 When she was a newborn, I thought she was my mini me, but now, she is so clearly half-him/half-me. Well, until we realized she is 100% Amish. BAHAHAHAHAHA! But really, how cute is that bonnet? Homegirl makes Amish chic look goooood. AHHHH this is so cute! You're both adorable. Grandma will definitely love these photos. She loved making that little dress!